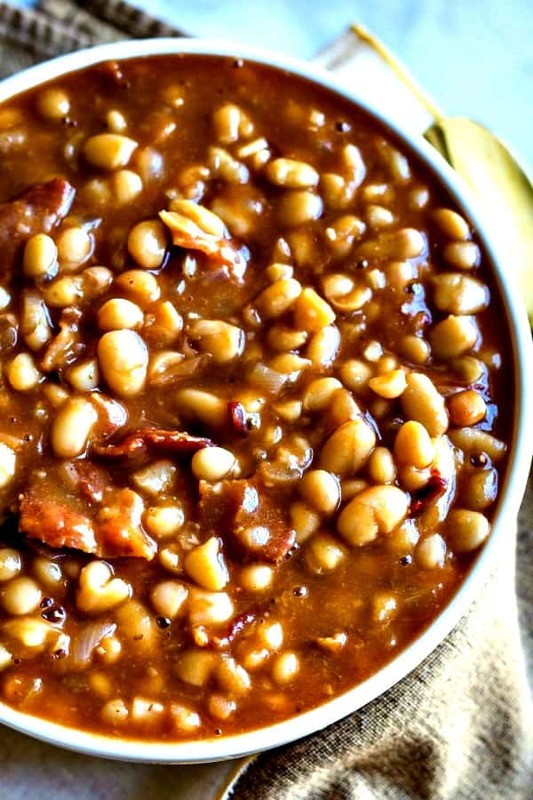 In the South, no outdoor barbecue is complete without a side of baked beans. Today, classic baked beans are getting a make-over with this Smoky Chipotle Baked Beans recipe. These spicy baked beans get their smoky flavor from bacon, chipotle chilies, and smoked paprika. If you dare, adjust the spice level by adding an extra spoonful of the chipotle chilies in adobo sauce. Or, just leave out the bacon to make vegetarian Chipotle Baked Beans. 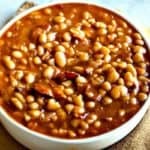 Smoky, spicy, and absolutely delicious, serve Chipotle Baked Beans at your next barbecue or picnic and kick it up a notch! 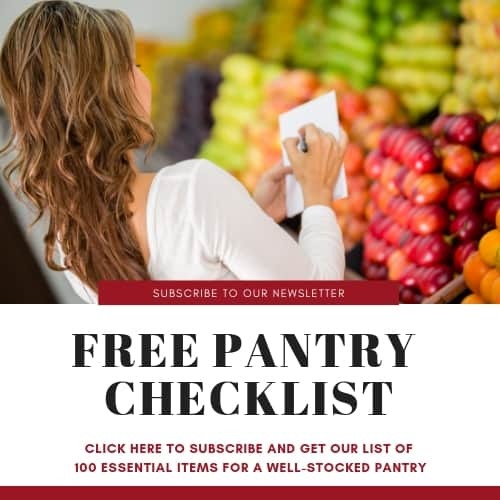 Sign up for our mailing list and get my well-stocked pantry checklist! Once the weather turns nice, John and I are chomping at the bit to get outdoors and get grilling. Lucky for me, John has developed an obsession not only for grilling, but for using his electric smoker. Lately, he’s been working on perfecting his recipe for ribs and homemade barbecue sauce — stay tuned, I hope to be sharing that on the blog soon — and I’ve been experimenting with making baked beans with chipotle chilies in adobo sauce. 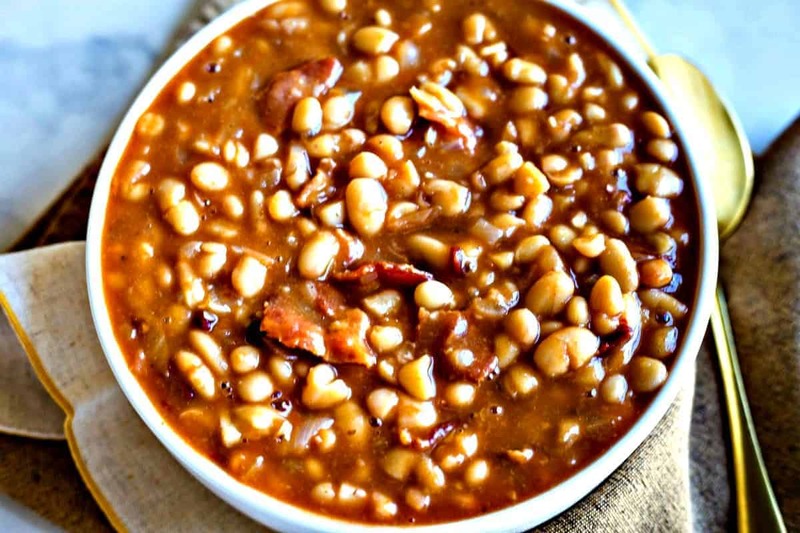 Unlike my classic baked beans recipe, this version does not contain any brown sugar. Instead, the sweetness comes from maple syrup. 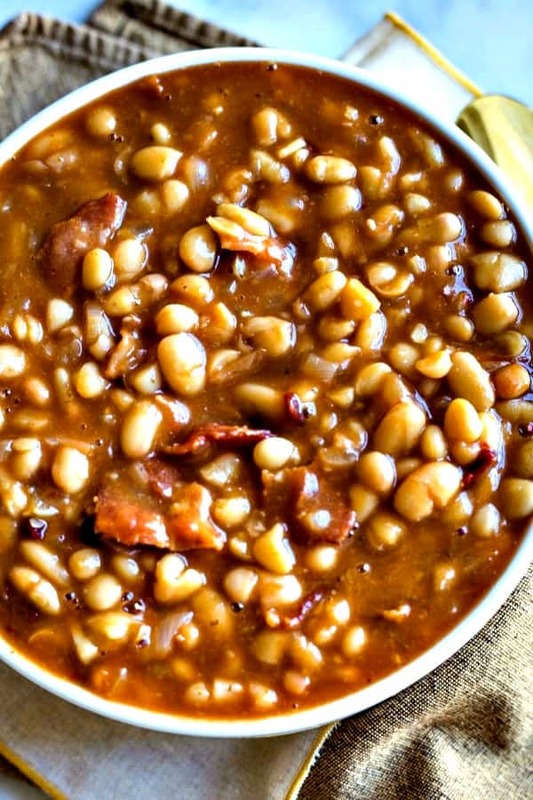 What ingredients are in Smoky Chipotle Baked Beans? First, fry four slices of bacon in a large skillet until crisp. Drain on paper towels and once cool crumble into small pieces — this will be added to the top of the beans before baking. Sauté the onion in a tablespoon of the bacon drippings over medium heat for about 5 minutes until they are translucent, but not browned. Add minced garlic to the pan and cook for another minute or until the garlic is fragrant. Next, add beans and all the other remaining ingredients (except for bacon) and stir. Pour the mixture into a casserole dish and sprinkle the crumbled bacon on top. If your skillet is oven proof, you can bake the beans right in the skillet instead. Bake the beans at 350 degrees for 45-60 minutes, or until hot and bubbly. Give them a quick stir and serve! Omit the bacon and sauté the onion in a tablespoon of canola oil or olive oil. Follow the remaining instructions and bake. More side dishes for picnics and barbecues! 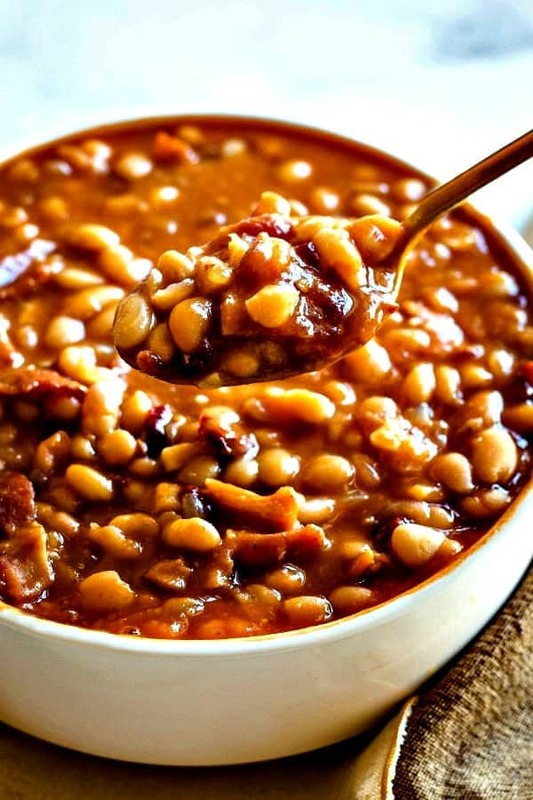 Did you make this Chipotle Baked Beans recipe? Let’s be social! 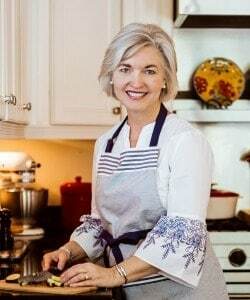 Follow me on YouTube, Pinterest, Instagram, Facebook, and Twitter! Preheat oven to 350. Lightly coat a 9x13 casserole dish with cooking spray. Fry the bacon in a large nonstick skillet over medium heat until crisp. Remove to a paper towel lined plate; cool, then crumble. Reserve 1 tablespoon of the bacon drippings. Add the diced onion to the pan and cook for 4-5 minutes, until translucent. Add minced garlic and cook until fragrant, about 1 minute. Add beans and remaining ingredients (except for bacon) and stir until combined. Pour the mixture into a 9x13 inch casserole dish. Sprinkle the crumbled bacon on top and bake for 45-60 minutes, or until hot and bubbly.